You've just received encouragement and your faith tank is full and hope fills your cup to running over .... this is when the Enemy attacks. The Great Deceiver doesn't want us walking in our destiny and purpose on this earth and he'll do anything to try to stop us. We must not listen to those negative messages that bombard our mind. We must choose to think on what is stored up in the brain for such a time as this. When the Enemy attacks, we must attack back with God's Word. Otherwise, you just crawl back into your depression culvert and wiggle your way to the darkest corner. God is faithful to send us words of encouragement and confirmations of His plans for our lives, but we have free will to make the choice to walk in those promises or to step outside His grace and be taken out of God's game of life where we were designed and destined to be the winners. Choice ... that's what many things come down to. Sometimes you wonder why God gave us free will ... but to have a loving relationship you need to choose. God created us to have relationship with Him and continues to desire one-on-one time with us. If we don't have a good mental picture of a loving father, we won't draw near to God who named Himself Father. Sadly, many parents are not the picture of God that He desired for them to be as we grew up. That's generally because they didn't have a great parental covering during their childhood either. All of this continues because the devil continually seeks to kill and destroy all that God desires for us. Each of us has a purpose and destiny and that's what we seek to find when we get saved and accept Christ as our Savior and Lord. We have to definitely know that the devil will try every way he can to steal our dreams, visions and God's greatest desires placed within our hearts. 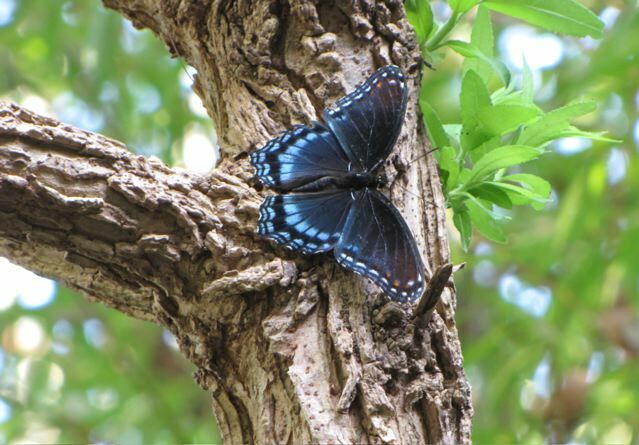 I was pondering all of this the other day as I watched a few Red-spotted Purple Admiral butterflies on our Black Willow tree beside the porch. We had pruned a large limb from the trunk because it was hanging too low over the walkway. That left an area that produced some sap that the butterflies wanted to delight themselves with; however, there were flies and wasps that wanted it also. I watched as I also chose to video the event. I was glad the butterfly didn't give up. In all its beauty, it stayed focused on its task and purpose, while those fluttering wings kept the flies at a distance. View Video. When we seek hard after God we can be assured of many battles in life, but we're also assured of the victory in the end. Hang in there. Battle the flies that try to chase you away from your dreams. Stick with what you know your purpose is for today and your destiny in Him will be revealed.